Q: Who will be riding in your go-kart? 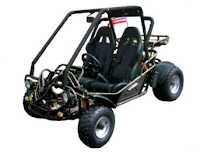 A: Important to determine the correct go-kart size; youth or full-size. Q: Should I have riding safety gear? A: As always, It's better to be safe than sorry. Gear never hurts. Q: Will there be children present when riding? A: Keeping small children away from all motorized equipment is always a good idea. Q: Does the go-kart have a speed limiter? A: Our products have this important safety feature which allows you to set a parameter. A: Our karts have a lever-operated adjustable system, allowing you to sit close or far away. Q: Are remote start keys included? A: To make life easier on you and the ride, our karts include these keys. Less can be more. Q: Can two people ride in one go-kart? A: Two people can ride together to double the fun, just be sure to think of safety at all times. Q: Are there two separate seat belts? A: Yes, and we strongly advise the use of these for both passengers at all times. Q: Where will the go-kart be stored? A: Storage can differ, though away from outdoor elements is advised. Treading new ground in a 4-wheeled go-kart may be the proper fit for you and your family.